For 2000 years now, young Christians have lived – and often died – for Christ, and with a courage that many adults find hard to muster. Although she was just thirteen, in 304 pagan authorities tortured and murdered brave Agnes of Rome for her Christian faith; for the same reason – and just over a hundred years ago – a Bantu king in Uganda burned to death young Charles Lwanga (c. 1863-1886) and his companions. The tales of these saints are told here, along with those of many others who, though young, have joined the ranks of the greatest saints: some by dying for their faith; many more by living for it. Louis IX is here. Crowned king of France in 1226 when he was but twelve-years-old, Louis’ holiness and wisdom, and his care for the poor, won him renown while he still lived, and lifted him swiftly to the ranks of canonized saints after he died. 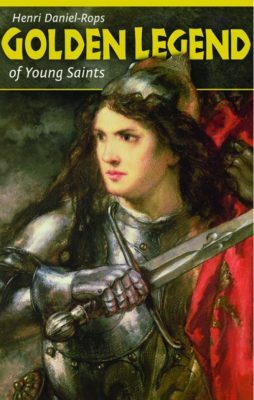 St. Joan of Arc (c. 1412-1431) is here, too, leading armies while yet a teen; but also saints whose names are not writ large in the book of history: Dominic Savio (1842-1857), canonized for the simple goodness that marked each day of his brief 15 years; and Bernadette Soubirous, the destitute 14-year-old to whom Our Lady appeared at Lourdes. Their lives of great and simple virtue remind us that “valor does not wait on years,” nor does holiness. To live in the love of God, in absolute obedience to His commandments, to practice the noblest Christian virtues, and even to offer our life in sacrifice – we don’t have to be grown up. Girls and boys, peasants and kings: and each one a saint! Christ is calling you to be like them, to cultivate in yourself what you know is best: kindness, courage, perseverance, faith, charity, and absolute trust in God. The example of these bold young saints will help you do so.